This site is designed for desktops and tablets. For the best user experience, we recommend using our mobile site from a mobile device. Charters - rent a Metrobus! Please complete the form below & click "Send Feedback" button. Metrobus operates in St. John's, NL Canada. If you are outside of Canada, you have the wrong transit company. 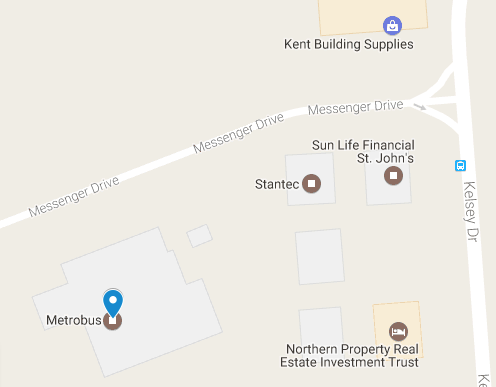 Our facility is serviced "on demand" by routes 10 and 16; when you board one of these routes, simply tell the Driver that you want to go to Metrobus on Messenger Drive and he will turn off Kelsey Drive and bring you to our new building. If no customers request to be taken to our facility on any route 10 or 16 trip, these routes will stay on Kelsey Drive/Goldstone Street as they do now. When you are leaving our building, be sure to ask the Information Services Rep (ISR) to radio the Driver of the 10 or 16 and ask him to service the building on the next trip by Messenger Drive. Looking to reload your m-Card? Our Mission: To provide safe and efficient public transit service for the City of St. John's. To ensure that our employees have the support and resources to deliver an affordable, customer-focused service on a cost effective basis. To implement industry-leading technologies in the delivery of innovative service. m-Mobile is everything you need to ride public transit in St. John's, NL, Canada. Plan a trip, view a schedule, find out if your bus is on time, read the latest service bulletins, login to view details about your m-Card or chat live with one of our helpful and friendly Information Service Reps. Allow this app to use your current location and it will detect your location and show the bus stops in your area complete with information about which routes service those stops. m-Mobile is the app for people on the move. Stay up-to-date with text alerts. The minute we post a service bulletin, we'll send the same bulletin to your mobile device. To subscribe, complete the form below and click 'Submit'. We do not charge for this service, regular message & data rates charged by your wireless service provider may apply. To UNSUBSCRIBE text STOP to 88188 or reply STOP to any of our text messages that you receive on your mobile device. Please enter your area code and 7-digit mobile device number without dashes or spaces. Metrobus is committed to the privacy and security of your electronic commerce. For your full understanding, the following statement details our information gathering and dissemination practices, as well as our security measures. We collect information from you when you register on our sites, place an order, subscribe to our newsletter, respond to a survey or fill out a form. For what reasons do we use your information? The email address you provide for order processing, may be used to send you information and updates pertaining to your order, in addition to receiving occasional company news, updates, related product or service information, etc. Our email practices are conducted in accordance with Canadian Anti-Spam Legislation, and any and all email correspondence received from us will contain easily identifiable unsubscribe links. We offer the use of a secure server. All supplied sensitive/credit information is encrypted and transmitted via the Transport Layer Security Protocol (TLS) to our, or in the case of a financial transaction, to our payment gateway provider's database, only to be accessible by those authorized with special access rights to such systems, and who are required to keep the information confidential. TLS is a protocol that ensures privacy between communicating applications and their users on the Internet. When a server and client communicate, TLS ensures that no third party may eavesdrop or tamper with any message. TLS is the successor to the Secure Sockets Layer (SSL). Upon completion of financial transactions, Metrobus does not store credit card numbers. If you prefer, you can choose to have your computer warn you each time a cookie is being sent, or you can choose to turn off all cookies via your browser settings. Like most websites, if you turn your cookies off, some of our services may not function properly. However, you can still place orders over the telephone by contacting our Customer Service Centre at 722-9400.